SAN DIEGO, April 20, 2017 /PRNewswire/ -- LifeProof pioneered Four-Proof technology protection with its award-winning smartphone and tablet cases. 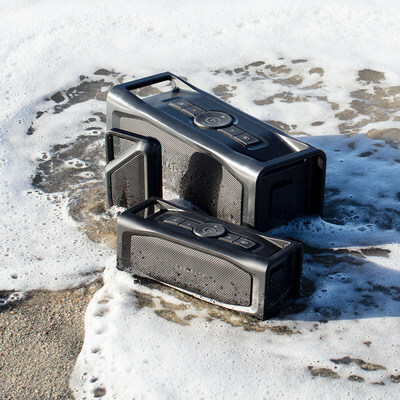 Now, the company that revolutionized waterproof, drop proof, dirt proof and snow proof technology expands its reach into audio with AQUAPHONICS Bluetooth speakers, available exclusively at Best Buy stores and at BestBuy.com. AQUAPHONICS comes in three lifestyle-inspired sizes for go-anywhere, do-anything premium performance. The AQUAPHONICS AQ9 and AQ10 will be available April 23, with AQ11 coming soon. "Music is a central thread we all share," said LifeProof CEO Jim Parke. "Cyclists, skaters, surfers, skiers – we've all got a soundtrack that 'speaks' to our passions. AQUAPHONICS is designed to come along for the ride, deliver high fidelity audio and provide the quality experience you expect from LifeProof." The speakers are portable, waterproof to 3.3 feet (one meter) for up to 30 minutes, drop proof to four feet (1.2 meters), sealed from dirt and snow and can pair with up to eight Bluetooth devices. All models have a built-in microphone to double as a speakerphone and deliver hi-fi audio in spaces big and small. With three sizes to choose from, there's an AQUAPHONICS waterproof speaker for everyone and every environment. Weighing in at under nine ounces, AQ9 is small but mighty. It delivers up to 16 hours of battery life and features a strong, reliable carabiner that makes it easy to attach to a bag or backpack for an on-the-go personal jam session. AQ9 delivers rich audio in a compact, go-anywhere design that comes in three color options. AQ10 is designed to fill big spaces with music for up to 13 hours. It floats when tossed overboard and has a built-in, water-tight drybox to store cash, cards and keys. AQ10 can charge a phone while the music plays and is offered in black and silver/green. AQ11 is made to turn gatherings into happenings. Outfitted for oversized audio, it plays crisp sound for up to 15 hours. AQ11 floats, charges a device while playing music simultaneously and its large drybox fits a phone, keys, cash and more. It will be available in black. 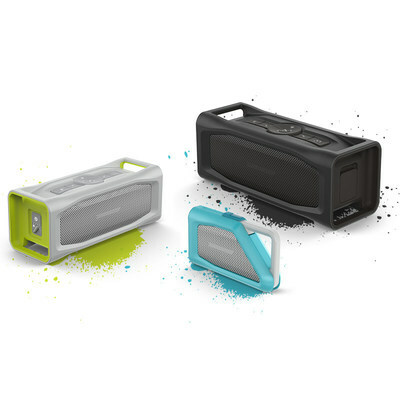 LifeProof AQUAPHONICS Bluetooth speakers are available now exclusively at Best Buy retail locations and bestbuy.com. AQ9 retails for $99.99, AQ10 for $199.99 and AQ11 for $299.99. LifeProof also protects the 'remote' to the AQUAPHONICS line, offering four-proof protection for smartphones from Apple, Samsung, Google and more. For more information, visit lifeproof.com or bestbuy.com.